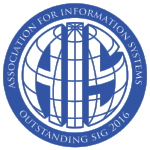 The Special Interest Group on the Adoption and Diffusion of Information Technology hosts its 28th pre-ICIS workshop for persons interested in information technology adoption and diffusion (DIGIT). DIGIT will be held in the morning of Thursday, December 13, 2018 in San Francisco. The theme this year is “Bridging the Internet of People, Data and Things". How is the adoption and diffusion of Information Technology changing in this era of global, interconnected space between people, data and things? This year’s workshop calls for papers that address these issues, as well as other topics related to the adoption and diffusion of IT. With the increase availability of data and connected things, the nature of the interactions with people is changing and individual and organizations are empowered with data and devices for many different purposes. From this can emerge networks of people, data and things that influence society and bring new dilemmas, questions and uncertainties for both organizations and individuals. Among others, a large number of individuals is challenged with adapting to those changes but we also see plenty of benefits for individuals and organizations. In order to understand the challenges and opportunities related to adoption and diffusion, we aim to provide an interactive forum by bringing together leading academics to discuss the critical issues of IT use when bridging the Internet of people, things, and data. Now in its 28th year the SIGADIT community offers the 2018 DIGIT workshop to provide researchers with an opportunity to discuss the implications of this development. Please see our DIGIT 2018 Call for Papers for further details. Submissions Due: Friday 7th September 2018 (Final deadline; there will be no deadline extension). Submissions. All submissions must use the Pre-ICIS DIGIT template. Faculty members and doctoral students are encouraged to attend and participate in the roundtable discussions and poster sessions. In order to foster the workshop atmosphere that has developed in previous meetings, registration will again be limited to about 50 people. Refreshments will be provided to attendees. You can register for DIGIT during the regular ICIS registration process. As only a limited number of seats remain available, please register at your earliest convenience. Looking for information and papers for past DIGIT Workshops? Please browse below for further details. 2009 - Phoenix, USA proceedings Adoption and Diffusion Research: What Matters Next?